"Keeping God in the Small Stuff" (with more than 100,000 copies sold) has been specially repackaged for the graduate, offering practical, accessible, and always biblical wisdom for every day of the year. Beautifully bound, it makes a perfect gift! - Publisher Bruce and Stan's Keeping God in the Small Stuff has sold nearly 100,000 copies since its October 2000 release...now that popular daily devotional has been repackaged as the perfect graduation gift! The practical, accessible, and always biblical wisdom of Keeping God in the Small Stuff is ideal for young adults launching out into the world. Following in the footsteps of the God Is in the Small Stuff Graduate's Edition, this special graduate's edition features a handsome new binding, a presentation page, and a brand-new section just for the graduate. 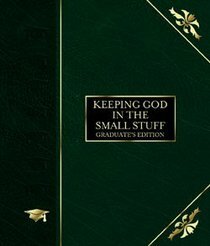 About "Keeping God in the Small Stuff (Graduate's Edition)"
Bruce and Stan's Keeping God in the Small Stuff has sold nearly 100,000 copies since its October 2000 release...now that popular daily devotional has been repackaged as the perfect graduation gift! The practical, accessible, and always biblical wisdom of Keeping God in the Small Stuff is ideal for young adults launching out into the world. Following in the footsteps of the God Is in the Small Stuff Graduate's Edition, this special graduate's edition features a handsome new binding, a presentation page, and a brand-new section just for the graduate. Bruce Bickel (JD., Univ. Of California) is an attorney, a corporate motivational speaker, and a frequent guest speaker at Christian conferences. His previous books with Stan Jantz include Knowing the Bible 101, Knowing God 101, and God Is in the Small Stuff. Over the past fifteen years, Bruce has filled that time-void by writing more than 50 books. More than 3 million copies of his books are in print, and several of his titles have achieved "bestseller" status. Stan Jantz is a marketing consultant and a partner in a community,building software company. Stan Jantz and Bruce Bickel are co-authors of over 50 books including Bruce and Stan Search for the Meaning of Life, Creation and Evolution 101, and the Christianity 101 Bible Studies. As a writing team, their goal is to present God's truth in a correct, clear, and casual manner.- Publisher.